Bannister joins the State Building Code Advisory Council. Marsha Bannister, appointed to the State Building Code Advisory Council in May, hopes to bring balance to the group. When she heard of her appointment, Bannister felt very humbled and honored. She also knew the job would be a formidable one, with the council dealing with huge issues impacting all Iowans’ housing and the affordability of homes. The challenge is the vying agendas of three key players—developers, builders and legislators—involved in the process of forming the state building code. Sometimes, the groups don’t see eye to eye. Bannister has the unique perspective of being on both sides of the aisle. She’s worked in the construction industry for 35 years and owns a real estate brokerage. She serves on the City of Clive’s Planning and Zoning Commission and Building Code Appeals Board. Could you Describe your professional background? How did you get into the construction field? I always knew that I wanted to be in the industry. 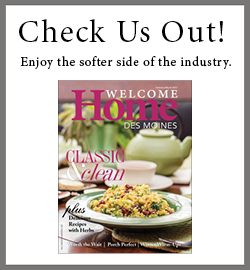 I was raised on a farm in southwest Iowa, and I remember my mom brought home a Better Homes and Gardens magazine and it had very neat, beautiful homes. I knew at 10 years old that’s what I wanted to do for a living. I wanted to make people’s dreams come true, by helping them find their home, build their home, or remodel their home and make it their own. In the 1980s, I worked for Dole Pineapple as their Assistant Director of Purchasing for the Pacific Basin. I bought building materials for the company’s compounds in different countries. When with Dole, I lived in Hawaii, and I was sick of being on an airplane all the time. So I came back to Iowa, started in the design business, and here I am 30 years later still loving what I do. I entered into the real estate industry 13 years ago and found I absolutely loved it. I had the honor of working for Iowa Realty for 11 years, then branched out and opened up my own brokerage, Homeworks, in November 2015. I’ve been on the City of Clive’s Planning and Zoning Commission for about eight years, and am serving my fourth year on Clive’s Building Code Appeals Board. What issues would you like to see addressed by the council? Personally, my big area of concern right now is that builders in Iowa are not licensed. That amazes me. You can build a home and not have a license—WOW—but you can’t sell a home with no license. I think the builders should be held more accountable. There should be a standard level of education all builders must meet. Right now, they are depending on subcontractors and city inspectors to ensure the work is being done correctly. If you’re going to build somebody’s home, I feel you should have continuing education every year, and that you have some understanding of the codes, rules, and regulations. You shouldn’t put that responsibility on someone else’s shoulders. You are being paid to oversee the entire process. For developers and builders, topsoil is one of the top issues right now. It’s become a tug-of-war between the government, builders, and developers, as they try to find a solution that meets everyone’s needs. One side goes all the way to the right and the other goes all the way to the left. Balance, we need balance. In one example, a city asked builders to put in 12 inches of compost back on the property when the building process was completed. But compost drops 2 inches when it gets wet. So now we’re back to doing more research and trying to come up with a better solution. Another local city is vying for even more rules and regulations. It’s out of control, and goes back to the tug-of-war theory. These are just two examples of how more thought has to be put into building codes and how they impact all groups. There’s got to be more balance. This means federal, state, and city municipalities must look at every regulation. Due to overregulation, in the near future many Iowans will not be able to own a home. How do you think more balance can be achieved in these discussions and decision making? Everyone has their own agenda and they cannot see past their agenda. What we need to do is to educate all sides and try to see each group’s point of view. I’ve been on both sides: I see the developer/builder point of view and I see the legislators’ point of view. Hopefully, I can bring some common sense to the conversation. We have built Habitat for Humanity houses for about the last 20 years. All of my appointed positions are unpaid; so right now, I donate about 20 hours a month to the city of Clive. I live in Clive part-time and Panora, where my brokerage is located, part-time. I have nine grandchildren who keep me very busy. I design and make furniture. Designing and drawing is my way of relaxation.